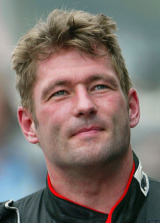 Jos Verstappen shone in the GM Euroseries in 1992 before winning the 1993 German Formula Three title. Snapped up as a result by Benetton for 1994, he was thrown in at the deep end when JJ Lehto broke his neck in testing. He survived a pit fire in Germany and then finished third in Hungary. Driving for Simtek in 1995, he qualified mid-grid in Argentina, Imola and Spain, but it all came to nothing when Simtek ran out of cash. He then struggled first with Arrows in 1996 and with Tyrrell in 1997, before joining the Stewart team midway through 1998. Dropped for 1999, he was back with Arrows in 2000 and came fourth at Monza. Strong showings early in 2001 were due to starting light; and this was because his Arrows could not carry a full fuel load. He was to score just once, though, taking sixth at the A1-Ring, then lost his drive just before the start of the 2002 season. Back in harness in 2003, Jos raced for Minardi and peaked with a ninth place. He revived his career and reputation in A1GP at the end of 2005, but lost his ride over a monetary dispute. His private lift has also been chequered. In 2000 he was found guilty of assault after an incident at a karting track left a man with a fractured skull, and in 2008 he was given a suspended prison sentence for violating separation terms with his estranged wife.